microVISC is the fastest viscometer for your routine viscosity measurement. The viscometer is intuitively designed so that users can start operating within a minute. It employs RheoSense's patented Viscometer/Rheometer-on-a-Chip (VROC) technology and offers accurate and repeatable viscometry measurements, using sample size as small as 100 micro liters. Battery-operated and portable, microVISC can be deployed at any laboratory location or in the field. microVISC has been adopted by leading companies worldwide as their choice for quick, easy, and rapid viscometric measurements. High precision and accuracy saves time and resources. micro VISC is ideal for your routine or frequent viscosity measurement. m-VROC is the leading small sample viscometer in biopharmaceutical applications used routinely by the leading biopharmaceutical companies at multiple locations globally. m-VROC is the ultimate viscometer for small sample protein therapeutics as little as 20 microliter and high shear rate viscosity measurement up to 1 000 000 s-1. This rotational viscometer is an instrument for the purpose of measuring absolute viscosity of Newton liquid as well as apparent viscosity of non-Newton liquid. 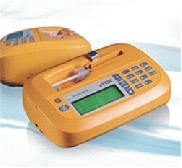 Combined with specific rotor, it can also test rheological property of non-Newton liquid. It is easy to operate and to maintain. This rotary viscometer features quick and easy operation. It can show measured value's percentage rate of the entire measuring range, which is convenient for the user to choose appropriate rotor and speed for accurate measurement. It is widely used in the measurement of viscosity on solvent based adhesives, emulsions, biochemicals, paints, coatings, cosmetics, printing inks, paper pulp, food, starch, etc.